Do you remember any food that has changed or shaped your life? For me it was cashew sour cream, overnight it turned me from being a vegetarian of twenty eight years to a person who eats a fully plant based diet. Cashew sour cream showed me how delicious food could be without having to exploit animals and also made me realise how much my body had been suffering from eating dairy. Feeling nauseous every time I ate sour cream or creamy products was something I was happy to say good bye to. Fermented nut cheese has not quite changed my life in such a drastic way as cashew sour cream did but has certainly made my taste buds very happy indeed. When I was eating dairy I used cheddar as my go to snack. Since not eating dairy I haven’t really had a go to snack until recently when I decided to keep a supply of fermented nut cheese in my fridge. Now I have a go to snack to look forward to when I am feeling a bit peckish or emotional (eech yes I am an emotional eater). The fermented nut cheese is so easy to make, its delicious spread on organic crackers, served on top of steamed vegetables or eaten with veggie sticks. It also is lovely spread on corn cobs when they are freshly cooked or great to use to stuff mushrooms. Soak the nuts for 6 hours in filtered water then discard the water. Place the nuts, fresh filtered water, probiotic powder, nutritional yeast and a few pinches of salt in a blender. Blend until completely smooth. Place the cashew mix in a bowl or glass pyrex and cover it with a damp muslin. Leave the cashew cheese somewhere away from the light in the kitchen for 6 to 12 hours to ferment. You will know when it has fermented as it will no longer taste like nuts, it will have a springiness to it and you can see it looks a bit more alive than just a water and nut mixture. When it is ready mix in the minced garlic, dill, lemon juice and salt to taste. Store in the fridge, it will last ten days or so in the fridge but not in my house, it is usually gobbled up before then. The book I have self published is now going through its final edition. 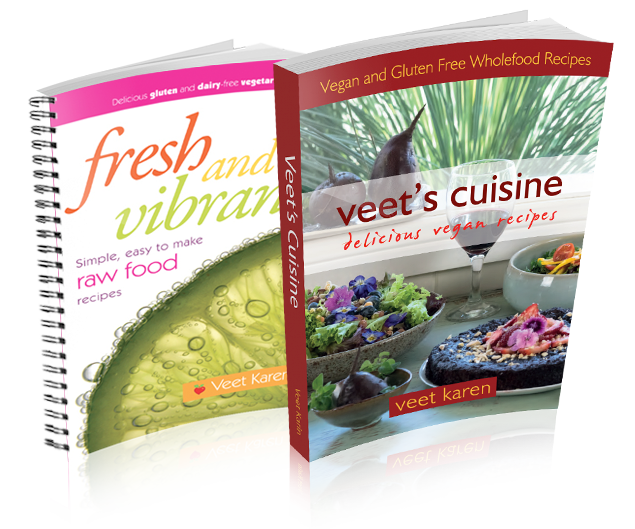 On the 14th of April it will be available for purchase in its new format of a fully vegan cookbook, Veet’s Cuisine, Delicious Vegan Recipes. I am so very excited and grateful to all the people who have helped me with getting this new edition to the printers. Thank you Makrand for all your editing work, my gorgeous mum Doreen Hedley for helping me with proof reading, Melanie Blint from Engana Graphics for the work to the covers and title pages and Cheryl Styles for the new front cover pic and photo of me. The book will again be printed locally at Mullum Printworks and will be in the same format so no pictures but I do plan to do a picture gallery at some point that you will be able to access on line if that is important to you. Hope you enjoy trying out the fermented nut cheese recipe and please do share with me if you have any food that has changed or shaped your life.